HOLDEN, Mass. 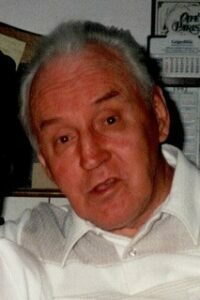 – Laurier J. Cote, 95, of Holden, Mass. and formerly of Lewiston, passed away on Feb. 5, 2019, at the Holden Rehab and Skilled Nursing Center in Holden, Mass. Born in Lewiston on Sept. 20, 1923, he was the son of Joseph and Marie Normand Cote. He served in the United States Army during World War II from 1943-1945. In 1952 he married the love of his life, the former Marie Antoinette Dube, who passed away in 2008 . Laurier lived with his daughter Linda in Holden, for the last ten years. Whether he was mowing the lawn, trimming trees, or some other type of yard work, you could always find him outdoors. Survived by his daughter Linda Bazinet; grandchildren, Stacey and her husband Michael Schriefer, Lindsey Jurkowski, Brian Bazinet and his wife Amy, Renee and her husband Billy Nelson, and Kevin Bazinet; great-grandchildren, Emma and Paige Schriefer, Austin Jurkowski, and Maia and Wyatt Nelson. Visitation will be held at the Albert & Burpee Funeral Home, 253 Pine St., Lewiston, ME 04240, on Tuesday, Feb. 12, from 10 a.m. to 1 p.m., with a Liturgy of the Word Service following at 1 PM. Committal prayers to follow concluding with military honors at St. Peter’s Cemetery. Condolences may be accessed online at www.albert-burpee.com .